Flower bulbs are a common solution for adding colour and visual interest to public green spaces. In the past, local authorities often limited themselves to planting Narcissus species and crocuses. Today, however, the trend is to plant mixtures of various bulbs and seeds together. Each of these mixtures is perfectly coordinated in terms of blooming period, flower height and colour. 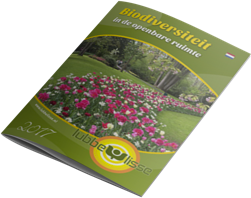 When composing its mixtures, Lubbe & Sons works exclusively with flower bulbs that can successfully naturalize in municipal flower beds or green belts. More and more often, a conscious decision is taken to use eco-friendly organic bulbs. In that case, it's important to ensure the public green space in question is maintained in an eco-friendly fashion as well.